A monitor with gaming pedigree? Computer monitors are behind the TV curve as far as 3D adoption is concerned. Visit an electrical retailer's website and 3D TVs - ones that are usually specified with HDMI v1.4a and a panel refresh rate of 120Hz - are forced into view. Notwithstanding NVIDIA's best efforts at popularising 3D for the PC, most monitor manufacturers tend to focus on full-HD screens (1,920x1,080-resolution) whose main attributes revolve around low response times and, crucially, aggressive price; you don't need to spend even £100 in order to pick up a reasonable full-HD 23in monitor. Iiyama, however, is aiming to encourage the gamer to invest in a larger monitor for their adrenaline-packed thrills and spills. The 27in ProLite E2773HDS, available for just over £200, offers greater screen size but the same resolution as a bevy of budget offerings. Advertised with a 1ms response time, the focus is squarely on gamers for lag- and ghosting-free playing. Stepping it up a notch, in terms of specification and price, is the £300 ProLite G2773HS monitor, equipped with a super-fast, super-smooth 120Hz panel. Designed with function over form, the G2773HS is an unprepossessing monitor. The plain exterior is punctured with five touch-sensitive buttons in the bottom-right corner. These provide reasonably intuitive control over the settings, though a larger on-screen display, centred, would not go amiss. A plastic stand simply clicks into the neck of the monitor and into place, making installation an absolute doddle. The monitor can't be rotated or height-adjusted, unlike the B2776HDS, though Iiyama provides 20° of upward tilt. Poke the fingerprint-friendly plastic bezel and the lightweight base, which is perfectly adequate at holding the screen in place, causes the monitor to wobble for a few seconds. Build quality, then, could be better, but tn the plus side the G2773HS includes a standard VESA mount on the back and packs in a couple of 2.5W speakers discreetly into the chassis. Iiyama harnesses the usual HDMI, VGA and DVI outputs familiar on the remainder of the ProLite 27in range. Bear in mind that obtaining the attention-grabbing 120Hz refresh rate requires the use of DVI - dual-link DVI, more specifically - and Iiyama bundles the relevant cable in the box. 120Hz and 3D tend to make for good bedfellows, but this monitor isn't certified for NVIDIA's 3D Vision or AMD's competing HD3D usage. Potential purchasers may not care one iota for 3D, but it's a tickbox that, for this model, is conspicuous by its absence. Instead, it seems as if Iiyama is looking to woo the gamer who requires silky-smooth refresh rates and super-quick response times. Most monitors ship with a default 60Hz refresh rate, meaning they refresh the image on the screen 60 times a second. Modern high-end graphics cards can produce frame-rates far in excess of 60fps, especially at a full-HD resolution, so it makes sense to pair them with a monitor that has a double-fast refresh rate. Switch it on and the factory-calibrated settings don't do the monitor any favours. The LED-backlit twisted nematic (TN) panel, which is thankfully non-reflective, produces colours that are muted and cool, and a pink-ish hue permeates across the screen. One needs to have a good fumble with the colour options before the G2773HS produces an acceptable picture. Annoyingly, moving between parameters doesn't affect an instant change; you need to actually select the option - warm, cool, and normal, for example - before it shows on the panel itself. The viewing angle is decent when looked at it sideways but poor from a vertical standpoint. Fine-tune the screen settings and things look up. The 120Hz refresh rate and quick response time pay dividends when snapping windows or moving icons from one side of the screen to the other. Alt+Tab between different	screens and the alacrity is impressive. 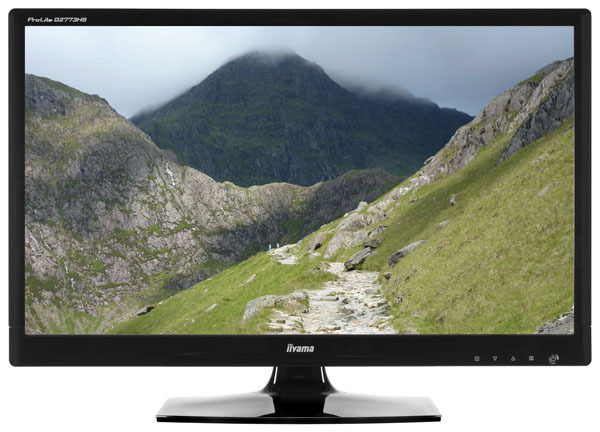 Compare the 2D performance against, say, a BenQ EW5430 24in monitor and the Iiyama feels just a hair nippier. The exact 'performance' improvement in nigh-on impossible to quantify, but it's present nonetheless. As we alluded to earlier, the G2773HS is aimed at gamers, so we fired up our high-end test-rig and played through Crysis 2, Battlefield 3 and Just Cause 2, with and without V-Sync enabled. With a Radeon HD 7970 GHz Edition making light work of medium-quality settings and consistently producing frame-rates in excess of 75fps, gaming was lush and smooth, helped by the trifecta of minimal input lag, fast response time and 120Hz refresh rate. Play on for a few hours and the gaming smoothness becomes expected and ingrained. Switch back to a 60Hz monitor and, while not wholly scientific, gaming feels just a bit off, as if the monitor is out of kilter with responses. That is not to say the Iiyama is perfect; colours remain subdued and the contrast ratio isn't brilliant, which are two known problems in using TN-type panels. Audio-wise, the twin speakers offer reasonable clarity when connected to high-definition on-board sound from the PC. There's a lack of heft and bass, understandably so, though the pair are adequate if using the monitor as a DVD playback device or ad hoc TV screen. Energy-wise, the screen pulls around 30W in use.